If you’re not already obsessed with Aussie influencer Wengie, then prepared to go on a YouTube video binge session. She has gained a whopping five million YouTube subscribers in less than a year, leaving her at over 12 million subscribers to date. Talk about impressive! The star gives her ‘Wengiecorns’ everything from hacks to DIY challenges to prank wars. But it doesn’t stop there. The breakout beauty and lifestyle doubles as a singer. Wengie released her first single, “Deja Vu,” this past summer and just wrapped her Create Your Summer Tour. 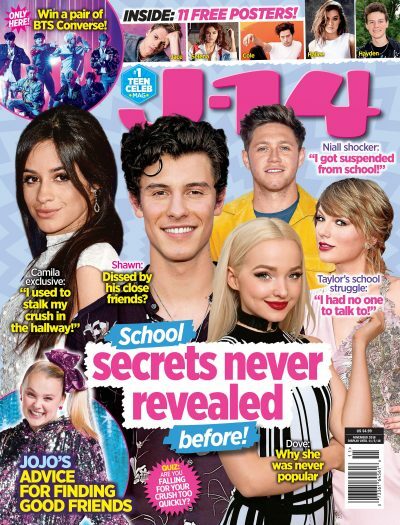 J-14 caught up with the star to chat all about her music career. And seeing as she rose to fame online, she spilled all about how she doesn’t let internet trolls get the best of her. J-14: Was recording music always something you wanted to do? Wengie: A lot of people don’t know this but I actually started off my YouTube making music covers and music videos purely because I loved it. It wasn’t until I joined a label in China and released my own singles that I even know it was possible. And my singles in China hit some music charts at #5 and #6! J-14: What was the inspiration behind the Deja Vu music video and what was your favorite part about filming it? Wengie: Deja Vu is having the feeling something has happened before, like reliving a memory. So I thought it would be fun to have my memories represented by potions you mix in a bottle. In the video, I’m mixing “my memories” (as potions) and jumping into the ones I want to relive. Also if you look carefully in the video I have my “memories” all in a shelf in my room. My favorite part about filming it was dancing to the song! J-14: Where do you find inspiration when creating new music? Wengie: My first couple of songs were inspired to create happiness! Cake is about cheering up after a bad day because of a relationship you have that brings you joy! Deja Vu is about reliving a great moment with someone special again and again! J-14: How do you not let mean comments get to you? Wengie: I learned very early on that mean comments on the internet can hurt. A lot! My first mean comment took me 6 months to get over! But after a while you realize that many mean comments come from a place of insecurity and negativity and are not really a true reflection of you. Then it becomes easier to not take personally! Of course I also welcome constructive criticism and use feedback to improve what I do. I believe that is also very important! J-14: Have you ever struggled with an insecurity and how do you work to overcome it? Wengie: Of course! It’s human to be insecure about things and that’s okay. As I’ve gotten older I’ve realized that every time I was being myself I got such a positive response from my fans. It really helped me embrace my individuality! J-14: What has been your craziest fan encounter? Wengie: I love every single hug I’ve been able to give to my fans, but one that really stood out was giving hugs to the students at McKinley Elementary School during their school assembly. We had such a giant group hug that we all fell over, but it was amazing! This event was also so special to me because we were able to donate 25,000 school supplies throughout America to kids in need through my limited edition school supplies box I designed with Yoobi.